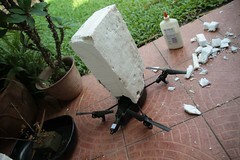 The difficulty with mounting an Hero HD on the AR Drone has to do with keeping the center of gravity. I tried mounting on the the nose, but it was so front heavy it tended to crash after a 'Too Much Angle Emergency'. I read some modification threads with counter weights but was warned of pendulum problems. Mounting it on top of the battery's velcro kept the center of gravity but made the rotors visible. The trick was to raise the camera high enough. After some experimentation I've found that the Hero HD bottom needs has to be about 14.5cm from the Drone body in 720p mode. At 14cm you could still see the tips of the rotors a bit. I've managed to crash the Drone a few times and it survived along with the Hero HD. That was until the first live shoot, my brilliant mounting system lost its velcro and leaned right. This caused the Drone to drift right in a hover. It hit a wall and caused an auto cutoff. The Camera and Drone fell eight feet. The Camera lost the part of the long sequence after the battery flew out. I would have lost more if I hadn't copied the raw unindexed footage first before attempting the SOS recovery. Needless to say it still works. 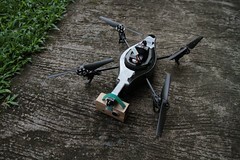 As for the Drone, it broke one of the gears which needs replacement, it won't fly for a while. Above mount tended to pendulum. This mount achieved level flight. The tricky part was keeping it balanced and attached to the body. Also no protection to the rotors. Outdoor mode and Outdoor Hull makes the drone finicky even without the wind. Don't use it. Watch the balance of the mount. Prepare some spare parts so your shoot doesn't get interrupted. Spare parts you may need after a crash.